So today I am getting started on the job of researching individual trainers at individual courses when their novice hurdlers step up in class. I'm going to start off with Nicky Henderson, simply because he has the most runners of the trainers that we have selected for this system. It may be a case the Nicky's charges are over-bet because of his status, but we'll look at the data and see what we can find. Because we are drilling down deeper and deeper the number of runners meeting a set of criteria will be less and less and it may be tricky to determine if a strike rate and profit is significant or not. When looking at which courses are most profitable for Nicky Henderson, novice hurdlers that are upped in class, I have only looked at courses where there have been at least 10 qualifiers in the last 10 years. 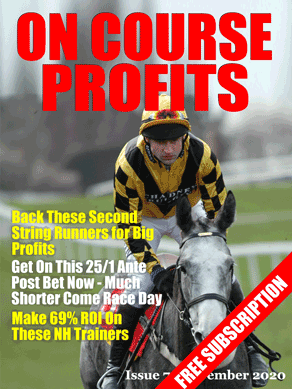 What jumps out is the huge profit (ROI) and strike rates at Huntingdon, Kempton and Ludlow. Nicky Henderson is based in Upper Lambourn which is on the M4 and relatively convenient for the top class venues of Newbury, Cheltenham, Ascot, Kempton and Sandown. Of the courses listed above Huntingdon is the furthest at around 100 miles from base. I'm not sure if we should read something into the class of the tracks, I suppose I'm surprised that Towcester isnt in the profit list, but the stats don't lie. This is definitely how it panned out in the past, let's hope it can steer us towards some winners in the future. Last week we highlighted in-form trainer Charlie Longsdon. He bagged us a winner that day and has followed up with another in midweek. He is still a trainer I want to keep on-side in the early part of the season and he sends a few runners to Carlisle today. On to Saturday and we have the last of the big handicaps in the Cesarewitch. Having already landed the Ebor and Cambridgeshire it is a tall order to land the hat-trick but I wouldn’t be doing my job if I didn’t at least share my thoughts. This race has gone to some big priced winners in recent times including winners at 66/1, 66/1 and 25/1 in the last three renewals. Weight and official ratings do not tell us much regarding potential winners but, with the exception of Scatter Dice last year, the previous 10 winners had winning form over 2m or further. Hurdlers have finished in the top two in 13 of the last 17 renewals. Other strong trends include a top 4 finish last time out and no more than 7 runs in the season. That helps reduce the field to 9. One who ticks plenty of boxes is Big Easy for Philip Hobbs and the trainer knows what it take to win this having done so with Detroit City in 2006. Big Easy looks to have solid credentials having finished runner-up in the trial race 3 weeks ago. That was his first flat run of the season and he should come on bundle for the run and he has a nice draw in stall 2. Another who is guaranteed to stay is Chester Cup winner Suegioo. He last two runs have been over trips shorter than 2 miles and I think he will relish every yard of this trip. He was also a fine 2nd in the Northumberland Plate over 2 miles and that race is a good pointer for horses who run well in the Cesarewitch. Another with solid prospects is Swnymor who has to turn the form around with hotpot favourite Quick Jack, but he takes him on here on much better terms (16lbs better to be exact). My only concern is his wide draw in stall 34 but with several bookmakers paying 6 places he is still worth an each-way interest. If you fancy taking something at a bigger price then the ultra-consistent Noble Silk, a good 4th in the Northumberland Plate, should give you a run for your money 33/1. Nicky Henderson trained the winner of this in 2008 and Kieron Fallon rode the winner in 2012. They team up on Earth Amber @33/1 and any rain would help his cause, although he is another from our short list who has been done no favours by the draw (stall 33). Looking through my Horse Race Base report today there is a selection from a system I added back in spring 2013 that has been consistently profitable. It hasn't produced a huge number of bets with just 40 in 18 months but a modest profit has been made that would no doubt be bigger at best odds guaranteed prices or Betfair SP. I think I picked this up from Ben Aitken of Narrowing the Field, google him up for lots of National Hunt tidbits. So the system basically is to bet David Pipe trained horses when they finished in the first four last time out and are reappearing within 11 days. Also the selection has to be male. The one that qualifies today is 2.20 Exeter number 4, Bathwick Man.